Online registration is provided by LANSW, follow the links for re-registration, new registration and family registration. You can access the site from 1 August each year. The registration fee includes entry to all competitions that the club enters, for example; Zone, Region, and State Championships. In addition, LANSW association fees, age group photograph, State Representative merchandise as provided by the club. Who can participate in Little Athletics? Children between the ages of 5 and 17 years can register. Parents, grandparents and friends can also be involved by helping with the various events. Yes, Hills Little A’s allows new families a 2 week trial period for a nominal fee. Trial weeks must be completed in the first two weeks of September. What age will my child compete in? Click HERE to access the LANSW age group calculator. Select the month and enter the year you were born, then click Go, to calculate your age group for the current season. If you were born on or after January 1, 2016, you are too young for Little Athletics. 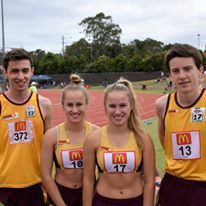 If you were born before October 1, 2001 you are too old for Little Athletics and should contact Athletics NSW. What events do children compete in? Our program runs over two weeks and the program can be found on our website. Tiny tots participate in a number of gross motor activities as well as a track sprint and modified long jump. These activities are designed to prepare them for Under 6’s. Under 6’s do long jump, shot put, 50m & 70m sprints a 300m pack start. Under 7’s do long jump, shot put, discus, 70m, 100m & 200m sprints and a 500m pack start. Under 8’s are as per the U7’s but they also do a 400m run, 700m pack start and 60m hurdles. Under 9’s are as per the U8’s but they also do high jump, a 800m run and 700m walk. Under 10’s are as per the U9’s but the walk is 1100m, they do a 1500m run. Under 11’s are as per the U10’s with the addition of triple jump and javelin. Under 12’s are as per U11’s the walk increases to 1500m. Under 13’s to Under 17’s are as per the U12’s with the addition of the 200m hurdles. Yes, all registered athletes must wear an approved centre uniform when competing in Little Athletics competitions. Hills Little A’s uniforms are available online from the Uniform Shop or on a Saturday morning or when picking up your registration pack. The uniform consists of singlet/crop top, and shorts/briefs/bike pants. Club socks, hats and jackets are also available. When do the children compete? Our centre runs on a Saturday morning. We start at 8am for all age groups except Tiny Tots which start at 8.30am. Age groups will finish at different times during the morning. Finish time is determined by a number of factors including the number of events that they participate in, the size of the age group, the number of parent helpers that an age manage has assisting them. Tiny tots will finish at 9:30am. No, we are not a baby-sitting service. We expect that a parent or other responsible adult stays at the ground. If you can’t stay it is your responsibility to ensure that your child’s age manager is notified of the adult who is responsible for your child while you are not there. Because Little Athletics is a totally voluntary organisation, Hills Little A’s cannot operate without the assistance of parents each week in fulfilling the many and varied duties required. We have a roster which has each age group allocated to a task every second week. This includes set up, pack up, BBQ and Canteen. The task will be the same for the entire season. We also include assistance in running our Saturday morning competitions. These include officiating at an event; managing an age group or assisting with an age group; or recording results. If your child is selected to compete at a Championship event parents will be rostered on to one of the duties that has been allocated to our club. Additional assistance is always required on our committees and all parents are encouraged to become involved. Little Athletics is one of the few sports where parents can become fully involved in their child’s sporting interests. It is the policy of this Centre NOT to refund any Registration fee if a member no longer wishes to be in the Centre for whatever reason. A two (2) week consecutive trial period is available for new members during the first two weeks of the Season allowing your child to trial Little Athletics. A $20.00 non refundable trialist fee is applicable which will be deducted from the Registration fee upon registering. Please note: No actual registrations will be taken at the club house on these days. If you have ordered uniform online it will also be available for collection with your registration pack. New athletes will be required to provide proof of age when collecting their packs.